UK performance sailing hardware manufacturer Allen Brothers announced this year's Allen Endurance Series at the Dinghy Show today, which will include the Forts Race at Whitstable Yacht Club. The sailing series is designed to test crews and equipment in extreme contests of skill and endurance, combining established events into a format which Allen Brothers believes will increase participation and competition, enhancing the endurance element of small boat racing in the UK. The format of this year's Forts Race has been updated to provide racing across a wider range of craft. Monohulls and single handed catamarans will now be able to enter, with the unique hub and spoke format of the Forts Race providing a range of course options and lengths, with the safety aspect of a regular 'check in' through a gate at the Whitstable Yacht Club. More details of the event will be published shortly, and you can stay in touch through the WYC website at wyc.org.uk/on-the-water/forts-race or by following the Forts Facebook page at facebook.com/FortsRace. 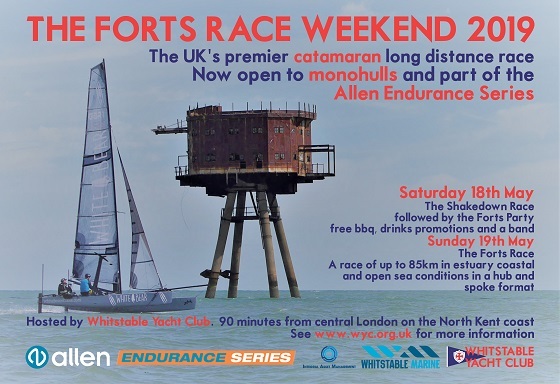 The Allen Endurance Series combines the Whitstable Yacht Club Forts Race, the East Coast Piers Race, the Round Sheppey Race and the Solent Towers Race into a series with overall winner(s), who will receive an Allen Voucher worth £500, as well as £100 vouchers for the winners of each individual event and other prizes for classes and legs. 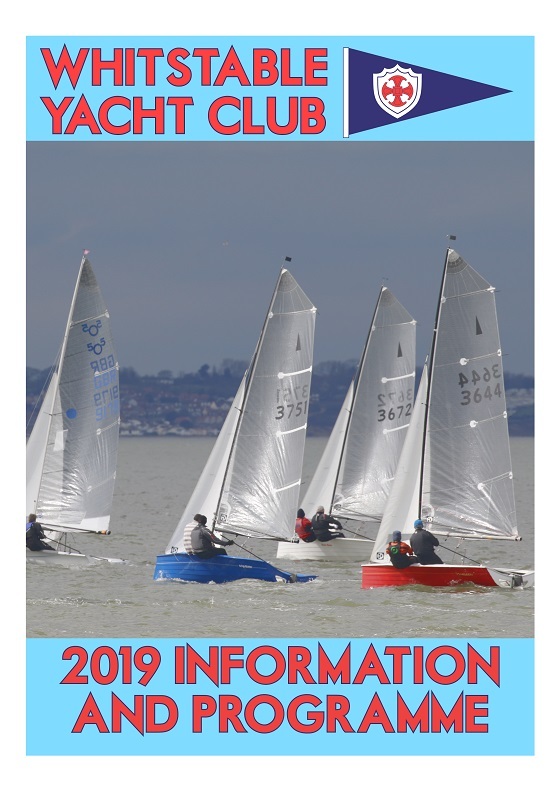 Sheppey Round The Island Race: August 31st / 1st September 2019, www.iossc.org.uk/islandrace/. 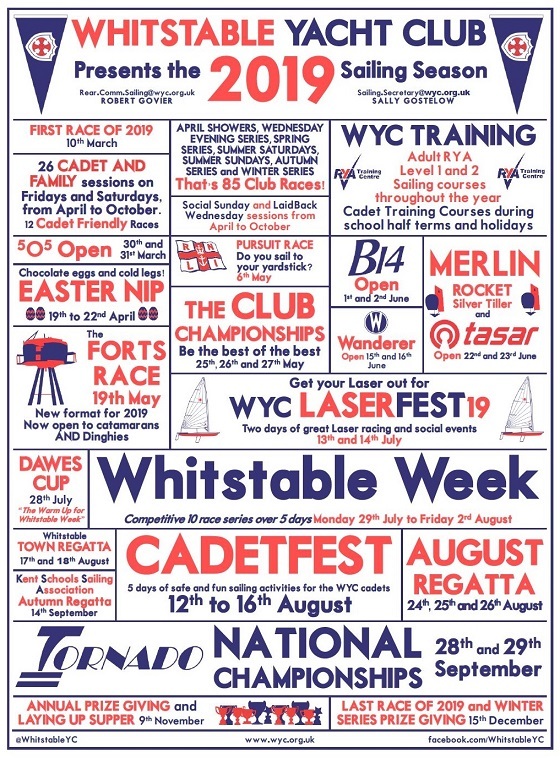 On Saturday 3rd August, 200 volunteers will help Whitstable Maritime present a full day’s entertainment and experiences on land and sea with 50 local and national organisations (including Whitstable Yacht Club!) already booked for Whitstable Harbour Day. 10,000 visitors are expected to enjoy the fun. In the Marine Environment Zone, local groups will be encouraging you to help protect people and wildlife from different forms of pollution. Others will be keen to help you identify the marine life and their habitats. Whilst the Heritage Zone will be offering expertise in discovering past boats, boat-building, railways and shipping. A firm favourite with children (and grandparents) is the boating pond and the hand-crafted radio-controlled model boats, not to mention a ride on the model steam train along the quay. Bands, live performances, children’s drama, good food, nautical souvenirs and local crafts help to complete this celebration of Whitstable’s maritime past, present and future. All making for a perfect family day out: and it is free! Thank you to organiser Andrea Oliver, and all of the members and friends who took stalls and sold cakes and raffle tickets on Saturday at the WYC Christmas Craft Fair. The event was a great success, raising £400 for the ramp fund! The notes from this year's Meeting of Sailors, held on Sunday 18th November, can be downloaded here: wyc.org.uk/about/Meeting_Minutes.